The travel companion for your Surface. Slim, light, and ready to travel, Surface Arc Mouse is designed to conform to your hand - and snaps flat to fit easily in your bag. 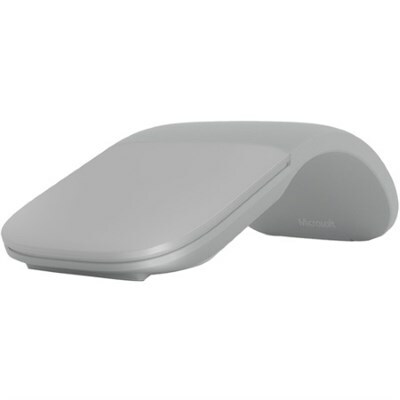 The next generation of our best-selling Arc Touch Bluetooth Mouse, Surface Arc Mouse features numerous refinements, including the ability to scroll both vertically and horizontally. Connects via Bluetooth. Ultra-slim and lightweight, Surface Arc Mouse goes anywhere without the weight or bulk of traditional mice. Just snap it flat and easily slip it in your pocket or bag. The Surface Arc Mouse features an audible, satisfying snap. Simply snap the Arc Mouse into its curved position to power up. Snap again to flatten and power down. The overall design is optimized for the most comfortable, natural interaction. Surface Arc Mouse lets you scroll both vertically and horizontally for easier, more intuitive navigation. Plus, enjoy precise tracking, with optimized left and right click. Surface Arc Mouse features a slim, smooth, unobtrusive design that's easy on the eyes and fits beautifully within your workspace. From scroll plane to tail, the Arc Mouse is soft to the touch and meticulously crafted to sit comfortably in your hand. Choose from 3 rich colors to complement your Surface device and your personal style.